Hand-foot-and-mouth disease, or HFMD, can send your child to bed in perfect health only to wake with sore bright red blisters erupting all over the body. HFMD is a contagious illness that is caused by different viruses. Despite its scary name, the illness is generally mild. Young children are more likely to get this disease but older children and adults can also get it. Everyone who has not already been infected is at risk of infection, but not everyone who is infected becomes ill. There are no specific antiviral drugs or vaccines available. The disease is characterised by fever and a non-itchy skin rash that is commonly seen on the palms of the hands, soles of the feet, and inside the mouth. The roof of the mouth, gums, tongue, and inner cheeks are most commonly affected. Additional symptoms may include common cold symptoms such as fever, sore throat, runny nose and cough. The rash commonly mimics lesions of a form of herpes simplex virus that causes chickenpox. But unlike herpes simplex, the HFMD rash develops very fast and usually does not itch. It’s bad for a few days and then it gets better without any treatment at all. HFMD is highly contagious and is spread person-to-person via direct contact with blister fluid, saliva, nose and throat discharge, airborne droplets produced by coughing or sneezing, and faeces. Eating and touching food with unwashed hands is a major causative factor in the development of HFMD. The viruses that cause HFMD can remain in a person’s respiratory or intestinal tract for several weeks to months. This allows for on-going transmission of the illness to those who are not immune (usually infants and children). The most common complication of HFMD is dehydration. If a child is finding it difficult to eat or drink due to painful mouth ulcers, offer ice cubes, yoghurts or other soft foods and avoid spicy and sour foods. Gargling or rinsing the mouth with salt water or an antiseptic mouthwash can often relieve the pain associated with mouth sores. It’s important to note that children with immune deficiencies such as HIV, cancers or other serious illnesses should be followed closely to avoid or promptly treat any potential complications. There’s no vaccine and little to be done by a doctor; viruses must run their course. Perhaps the most important distinction between bacterial and viral illnesses is that antibiotic drugs usually kill bacteria, but have zero clinical value against viruses. Inappropriate use of antibiotics has helped create strains of bacterial diseases that are resistant to antibiotic medications. Antimicrobial resistance poses the potential risk of making previously treatable conditions untreatable. 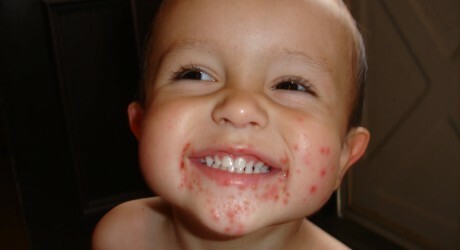 The best treatment for HFMD is prevention. To reduce the spread of the virus, public health officials advise frequent hand washing with soap, covering one’s mouth and nose when sneezing and coughing, and good personal hygiene. Frequent hand washing with soap and water is advised especially after touching any blister, before preparing food and eating, before feeding young infants, after using the toilet and after changing nappies. HFMD it is not transmitted to or from pets or other animals and is not related to the disease with a similar name that affects animals. Dr Cory Couillard is an international health columnist that works in collaboration with the World Health Organization’s goals of disease prevention and control. Views do not necessarily reflect endorsement.